Skin & Gut-Health – potentially two of the biggest subjects known to humankind, especially females. But what has collagen got to do with this? Well, a lot more than you probably knew or ever thought about. Collagen makes up over 30% of our bodies total protein and is the most plentiful protein in the human body which is found in bones, muscles, skin, teeth and tendons. Collagen is the substance that holds the body together by forming a scaffold to provide strength and structure within the body. Endogenous collagen is natural collagen, synthesised by the body. Exogenous collagen is synthetic which means it comes from an outside source, such as supplements. These collagen fibres along with elastic fibres in the deep layers of your skin allow you to contract your muscles and ligaments and help the skin to bounce back. The decline in collagen and elastin in your skin results in the skin sagging and becoming looser while losing the ability to contract back as it used to. However, for the body to use the endogenous collagen we’re ‘feeding’ it, it has to be taken with the vitamin C for it to be used by our bodies the way we want it to. This also goes for the gut, as all good gut-health starts with good bacteria, a good working digestion and enzymes that can break down the collagen to help build up the gut-lining and further portray itself throughout our bodies. Remember the gut-lining is made-up of soft tissue that can easily break-down if we don’t nourish it with what it needs e.g. collagen, vitamins and minerals, so it’s important for us to strengthen it however we can. In the mid 20’s, the body’s own natural collagen production starts to decline at a rate of 1.0% – 1.7% per year and is not replenished. There is an even more pronounced decline in collagen production around the age of menopause due to the drop in oestrogen. Oestrogen levels are directly correlated with collagen formation. Over time this diminishing supply of collagen causes the skin to lose its’ suppleness and in turn, your skin can begin to wrinkle and sag, hence why we want to feed our bodies with collagen through supplements & good whole foods. A good Collagen Supplement like Inessa Collagen+ Beauty Boost will help with vision, skin health, cardiovascular health, bone & joint health and so much more. In particular, if you have wrinkles, dull skin, tummy issues, leaky gut or even acne-scarring, collagen can help you significantly. Especially, if your diet is more plant-based, collagen supplements can really help you take your game up a notch. What & how should I take Collagen? One thing is for sure; the skincare products like lotions and creme’s that contains collagen and promises you less wrinkles, more plump skin and much more, isn’t true; it’s simply impossible to absorb collagen molecules through the skin as they are too large to be absorbed that way. I’ve trialled Inessa Collagen+ Beauty Boost for a few weeks, and I’ve noticed a difference in my joints especially, as I get very tight hip-flexors and back muscles from sitting down for long periods of time to work. People have also been commenting further on my skin, and it’s been a great addition to my skincare and also whole foods diet. If you’ve followed me for a while, you’d also know that I am a big on gut-health and anything I can do to repair and strengthen my own, I’m on board with! My tummy has been feeling great on these tablets, it’s been by no means irritated or given me reflux, meaning they are very gentle on the system. 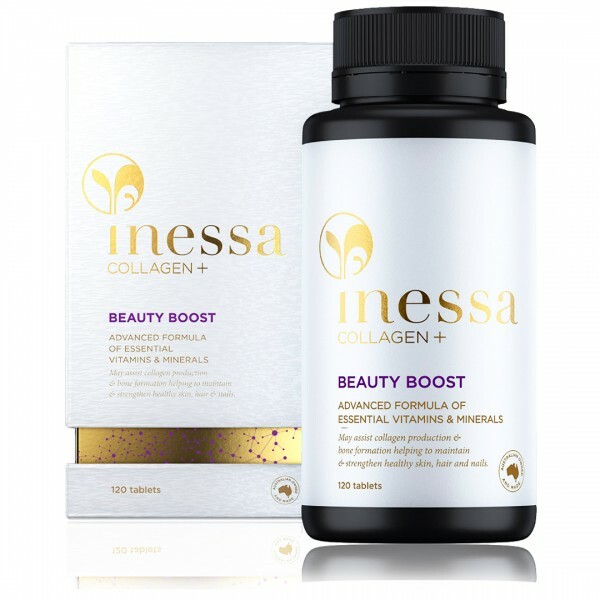 Inessa Beauty Boost and the entire collagen-range was developed an understanding that the superior way to enhance collagen production is to provide the body with the nutrients it needs to create its own natural collagen and support the body with with all other necessary supplements. The entire range is also TGA approved which is a huge bonus, meaning it’s ingredients are proven to work and the claims they are making are actually factual and proven. All you need is 2 x tablets with food in the morning and evening. Easy peasy!